October 30, 2018 (Investorideas.com Newswire) A company that helps potential Lyft and Uber drivers obtain cars is the focus an article by Daniel Carlson of Tradewinds Research. Have you noticed that Uber is advertising on television these days? We saw an ad this weekend and my wife looked at me and said, "I can't tell if they're advertising for riders or drivers." Exactly! What most people don't realize is that the issue from which both Uber and Lyft are suffering is not needing more users of their service. Instead, it's a lack of drivers to ferry their passengers. This is why Uber is now advertising. It makes sense that ridesharing companies are having trouble finding drivers. If you consider that the economy is booming and unemployment is at record low levels, the eligible pool of people looking for a job is greatly diminished. Meanwhile, those looking to drive are generally right out of college, meaning they typically have a tremendous debt burden and, at the same time, likely don't have a car that fits the platforms' requirements. This results in a very large portion of the prospective applicants for a driving position on a rideshare platform not being eligible to do so for lack of wheels. 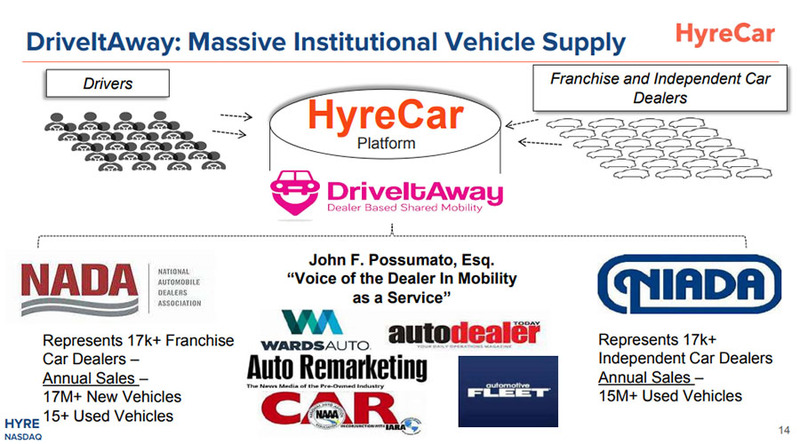 This is where HyreCar (HYRE:NASDAQ) comes into the market. HyreCar is a platform that connects drivers and vehicles available for lease, so that the drivers can work for an Uber or Lyft. This is a service that is in very high demand and growing rapidly. As a result, HYRE shares are looking very attractive at this time. As the below chart shows, the rideshare industry is expanding rapidly, well on its way towards being a $1 trillion industry. 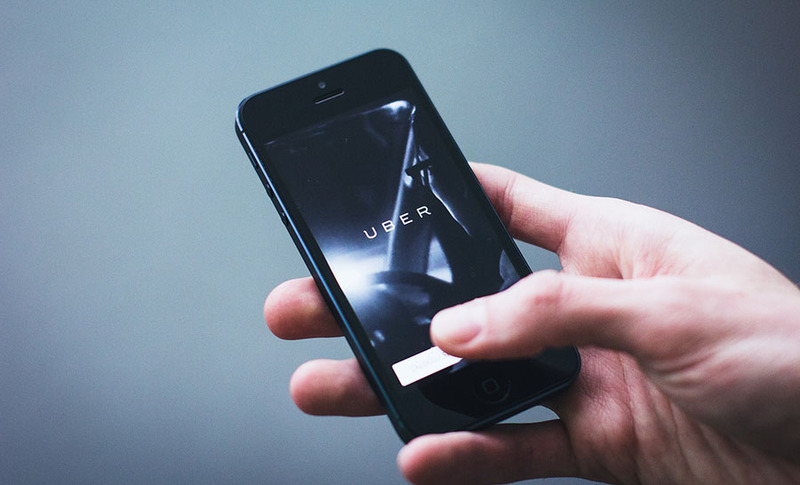 But, according to HYRE, an estimated 40% of Uber and Lyft drivers need a vehicle. It is this demand for cars that is enabling HYRE, at its current small size, to outgrow the market dramatically. By our estimates, we forecast HyreCar more than doubling in revenues for each of the next few years. This growth is very achievable when you look at the current run rate of the company, what it has accomplished lately, and the number of drivers that are contacting it. We estimate that HYRE is running over 1,300 daily active rentals. This number is up from less than half that amount six months ago. It has more than doubled in that short time frame. Using the company's guidance for $10 million in revenue in 2018, we estimate that it will need to have over 1,800 drivers on the platform by year-end. This is well in excess of a 100% annual growth rate. Importantly, with over 23,000 driver inquiries incoming to the company this year, there are plenty of drivers to achieve this growth. 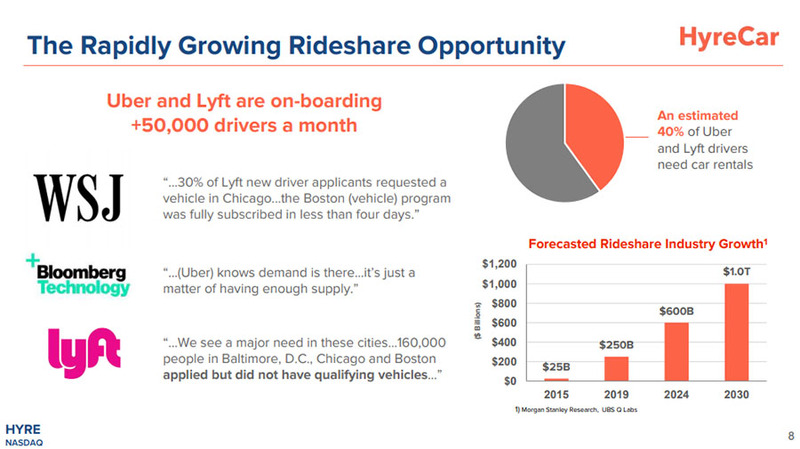 And, with 40% of potential rideshare drivers needing a vehicle, it is only scratching the surface on potential growth. One could easily see HYRE having a $100 million or more run rate, without making a significant dent in the overall market. With 40% of potential rideshare drivers lacking vehicles, there's an obvious business opportunity putting drivers together with idle cars. HyreCar solved the issue of the insurance aspect of this, which is what has given them a head start on the competition. But, the real key to scale in this business is finding a large supply of available vehicles. This is where HYRE's partnership with DriveItAway is key. In partnership with DriveItAway, and John Possumato, HyreCar is rapidly expanding its dealer network, which gives it potential access to a large quantity of cars that are currently sitting idle at dealerships. "The reception to our dealer enabling program has been overwhelming," said Joe Furnari, chief executive officer of HyreCar. "As a result, we are mobilizing very quickly to meet dealer demand all over the United States. These dealer additions will help us meet the increasing demand for ridesharing-approved vehicles, while also adding additional vehicles to our growing platform." The demand is there, and HyreCar is expanding its supply of cars. This is going to enable the company to continue its astronomical growth rate for the foreseeable future. So, what does the valuation look like? At $2.00 per share (the price as I'm writing), HYRE's market cap is under $25 million. This puts it at a price-to-sales multiple of 2.5 times 2018 numbers. This is very cheap for a company that has margins at over 40% and is almost of unheard of when you consider the growth rate being well in excess of 100%. Meanwhile, it's not like the company is going to need money sometime soon. It is only spending about $1 million per month in OPEX and keeping that level fairly constant. By my estimates, this means it can be cash flow neutral at around 1,750 cars on the platform, a number it should exceed by year-end based on its revenue guidance. HYRE is an example of a failed IPO. The company went public only four months ago, at $5 per share, and here we sit at $2. The reasons behind the failure of the IPO are several, but, importantly, none of them relate to the current business of the company. Instead they center around the mezzanine financing (these guys sold) and, more recently, a tough market for small-cap companies. On the positive side, however, insiders, including the CEO, have been buying shares in the open market. This is usually the best indication of the current state of a business and, also, the inherent long-term value. If the CEO's purchase is any indicator, things are going well and the stock is cheap. This is certainly what Tailwinds believes to be the case. This article was submitted by Tailwinds Research. For more information on Tailwinds Research or on HyreCar, please visit www.tailwindsresearch.com. Tailwinds is engaged by HyreCar and owns stock in the company. For a complete list of disclosures, please click here. 1) Daniel Carlson: I, or members of my immediate household or family, own shares of the following companies mentioned in this article: HyreCar. I personally am, or members of my immediate household or family are, paid by the following companies mentioned in this article: None. My company has a financial relationship with the following companies referred to in this article: HyreCar. Additional disclosures and disclaimers are above. I determined which companies would be included in this article based on my research and understanding of the sector.